There will be 32 golfers left standing after the first day of the World Match Play - has Dan Geraghty picked out six of them? "Now back among the world's elite, Henrik Stenson can progress past Steve Stricker who is making his first start since early January and has a disappointing record in this tournament when it's been played in Arizona." Welcome to the big leagues, Robert Garrigus. This is only the big man's second WGC start and his first in the Match Play. The course looks like it will suit; his enormous length from the tee will be a big advantage and the talented American has been in fantastic form this year. Opponent Branden Grace is also making his WGC Match Play debut. He has his work cut out. Before he lost his way, Henrik Stenson had a great record in the desert with a a record of 12 Match Play wins and five losses. Now that he's worked his way back among the world's elite the Swede can progress past Steve Stricker who is making his first start since early January and has a disappointing record in this tournament when it's been played in Arizona. 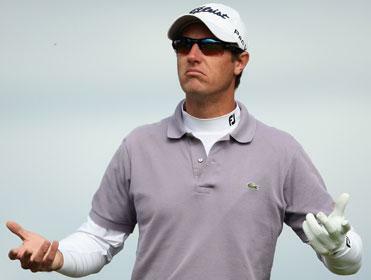 Last week I backed Nicolas Colsaerts to win his three-ball and he played his last three holes in five over to lose by one shot including a three putt from eight feet on the last to rub salt into the wound. However, despite all that, I'm going back in again this week. The Belgian bomber obviously has a taste for the format after last year's victory at the Volvo World Matchplay and the course looks right up his street. Opponent Bill Haas has a disappointing record here, odds-against on Colsaerts looks worth chancing. Perhaps the most intriguing of the first round matches are the two all-Irish affairs. I'll leave world number one Rory McIlroy and Shane Lowry to battle it out without the weight of our money, but I'm happy to take Padraig Harrington to beat Graeme McDowell in the other tie. Harrington will be hungry for success after missing the event last year and has started the season in promising form (despite his recent missed cuts). Of the really short prices I like the look of Louis Oosthuizen, who only has one win from four matches here, but all of those games have been close. I fancy the South African to improve on that record his week, starting with victory against debutant Richie Ramsay in round one. And finally, Keegan Bradley looks like a tough assignment for Marcus Fraser in round one. The American looks made for matchplay and with last year's debut under his belt could be set for a good week.